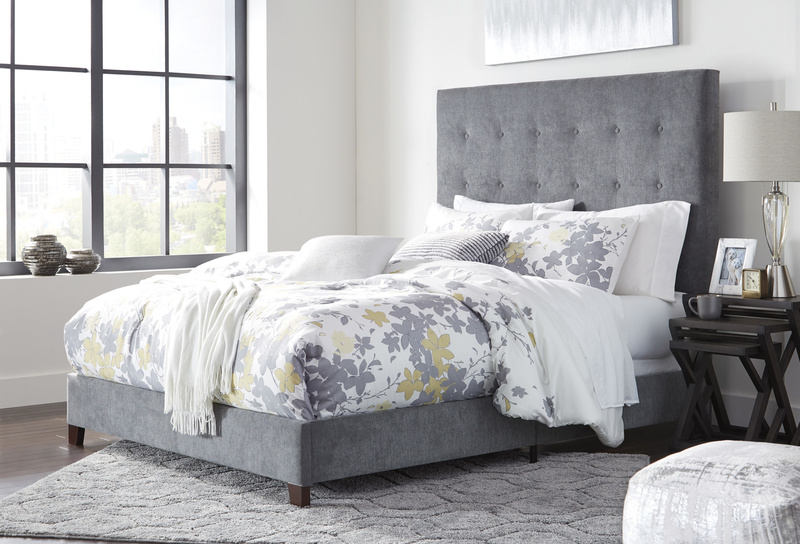 Live the dream of a high-style bedroom retreat with the Dolante queen upholstered bed. Generously scaled headboard is beautified with subtle tufting that adds an upscale touch. Low-profile styling brings a chic, modern sensibility to your space. Mattress and foundation/box spring available, sold separately. B130-381,382 bed is fully upholstered platform look bed covered with a gray fabric in a soft 15 square stitched headboard design. B130-581,582 bed is fully upholstered platform look bed with a cream color fabric cover. B130-781,782 bed is fully upholstered platform look bed covered with a gray fabric on a headboard design with vertical channels. B130-281,282 is made with a brown "bomber" style PU cover that gives the bed a rich, weathered appearance and is accented with gold tone nail head trim. B130-081,082,881,882 chic headboard with either tufting or channeling bed designs. B130-08x has grayish brown faux leather, B130-88x has gray fabric. Low platform for contemporary look. Packs complete in one box for Express Ship. Foundation/box spring required. B130-681/682 features a light beige colored fabric and biscuit tuft pattern.